Enebelingu Elebuwa is a household name in Nigeria. To most people, he comes across as “Andrew”, a character who desperately wanted to “check out” of the country but was prevailed upon to stay back and join in the task of nation building. The charismatic and talented actor hails from Utagba in Ndukwa West Local Government Area of Delta State. He has traveled far and wide in the course of his career. Elebuwa studied Civil Engineering in a Technical School after which he attended Television College, Jos and the BBC for production training. 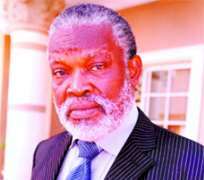 He worked in NTA from 1982 till 1997 when he retired. And since then, Elebuwa has stuck to Nollywood. In this rare encounter with Blockbuster, the veteran actor opens up on many issues including his life, career, family and regrets. When I first started, it was all like a joke. I joined the Star Club in Apapa road, Lagos where we used to do drama in Yoruba in 1967. It was like a concert party and that's how I was introduced into the acting world. Actually, the first film I acted was in 1970. I was a member of a theatre group and a musician with Victor Olaiya's All Stars. The first film I did was “Dinner with the Devil” directed and produced by the present King of Owuland, Oba Sanya Dosumu. Wole Ani and Jimmy Coker starred in the movie. Making movies in those days was different from the way we do these days when shoot a movie in just seven days. We were then shooting in celluloid which took a lot of time than the video recording. Later, I did “The Rise of Oyenusi” produced by Eddy Ugboma, which was shot on celluloid in 1977, followed by “Song Bird”. I also acted in “Village Headmaster” for a long time before the home video started. I was a musician before venturing into the movies, and I'm still a musician but a lot of people are not aware that I play music. I played with different bands in the 1960s through the 70s. I played in late Sonny Okosun's band. I was a pioneer member of the band before it became Ozzidi. I have worked with a lot of musicians but acting has been taking so much of my time. I was inspired by some great actors I watched in the movies while growing up and I loved what they were doing. There are two characters that really inspired me, and the first was Yul Bryvur, a Mongolian from East Asia. He was a very good actor that really touched me by the way he walked. But we later found out that he had a sickness that made him walk like that. He would spread his hands and be moving like some wild animals in the bush but well calculated. You wouldn't ever wish to walk like him but he was able to carry his sick body in a dignified manner. Cathy Hasten was another actor who inspired me and then Richard Burton. I am an ordinary human being, nothing special I'm just like every other person except for my interest in acting. Though, we need money to sustain ourselves, emphasis on money has become a great problem in this country. Materialism has reached an alarming rate but as an actor I am pleased with myself. I'm not satisfied with the remunerations, which means even at my age unless I set up my own production outfit I can not earn something reasonable. Economically, it hasn't being a success but artistically I'm fulfilled. I don't understand what Nollywood is all about. I don't know the meaning of it. Nollywood is incomplete and crazy. I don't know what it means. If they address it as Nigerian movie industry, it is understandable. Hollywood is a town in America while Bollywood was named after Bombay. Where is our own Nollywood originated from? I want to be educated by those who named it to know what it stands for. Let's not call ourselves anything because we want to sound wood, it doesn't make sense. The most challenging role hasn't come yet but I have played a role that I thought was challenging in an epic film in Igbo entitled “Journey to Hell”. I played a spirit who received a youth who had an accident and was between life and death. I met and treated him in my own hospital in my kingdom (kingdom of the spirit). I love the movie because the producer, director and I worked on the character. I enjoyed the role but unfortunately the film didn't make wave in the market because the post production was not properly done due to lack of finance and it was not well distributed. But I'm still waiting for a movie that will challenge me because challenges push people like me. As an artiste, I like challenges, something that makes me work harder out of the ordinary. I am a family man with six lovely kids. I love my family dearly. I am not sure if any of my children will take after me since some of them are still under age. My first son is currently studying Engineering and he is also a fine artiste. His immediate younger brother is studying Accountancy while my third child is studying Law. However, the fourth child, a girl is 11years old and she said she likes acting. My twin boys are two years old and they love singing. I will never force a career on my children, they have to choose for themselves because my late father never chose for me. He was even dead before I made up my mind on a career. It is not easy to cope with stardom in Nigeria because stardom means money. Everywhere I go Area boys demand money from me, even street hawkers demand money from me because they see me on television and they think I am a rich man not knowing that sometimes I am broke. It is not easy coping with that because we don't have money to leave up to their expectations. As an artiste, I don't regret anything at all. But I wished that the corporate world can invest more in the industry because there is money in movie making. I appreciate the fact that we are more interested in our own products than the foreign products. Nigerians love what we are doing, we need support as well to enable it stand like every other industry and the nation will also benefit. Government stands a chance of making a lot of taxes from our jobs not just the individual tax but on production, and I'm happy that the Nigerian Film Corporation and Censor Board are doing a good job. If given the chance, I would have been a monk on the Himalayas praying for peace and living for the good of other people till the end of time. I'm an actor though, I intend doing another thing when I eventually quit acting. I feel I should involve myself in some of the things I was doing before acting. I used to be a painter and I miss my table, colors and then music. I painted till 1981 when I got into NTA. I was just a painter and later added graphics but for now I'm available for any good role that comes my way. However, I hope God will give me long life to enable me set up a studio in my village where I can do my painting work.